One of our users recently asked us why they can’t see some of their plugins on their WordPress multisite network. After they installed the plugins, they were unable to locate them on the plugins page in their multisite network. In this article, we will explain why do you not see all plugins on WordPress multisite installs, and how to fix this. WordPress multisite network allows you to run multiple sites using the single WordPress software. 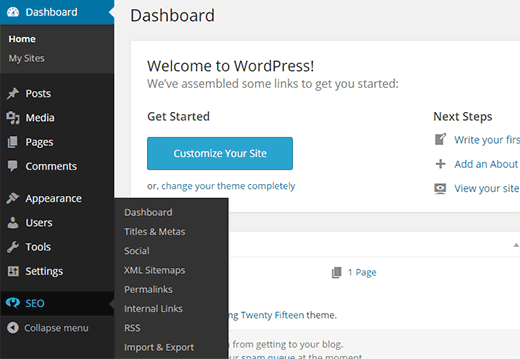 You can install themes and plugins for all sites on that multi-site network. There are two different plugin screens when you login as super admin to the main site of your WordPress multisite. The first plugin screen allows you to activate plugins just on your main site, but it does not allow you to install new plugins. The second plugins screen is located under My Sites » Network Admin » Plugins, it allows you to manage plugins for your entire network. To install a plugin on a WordPress multisite, you need to visit My Sites » Network Admin » Plugins. On the network plugins page, click on the add new button to install a new plugin. After the installation, you will see a link to network activate the plugin. Once you network activate a plugin, it will be available to all the sites on your multisite network. Individual site admins cannot deactivate or remove it. This is why network activated plugins do not show up on your root site or any child site’s plugins page. If you decide not to network activate a plugin after installation, then you will be able to see the plugin in your root site’s Plugins screen. From this screen, you can activate the plugin only for the root site. When you setup WordPress multisite network, you automatically become the Super Admin. This gives you the capability to install plugins and themes for all other sites on the network. The site admins for an individual site on your network do not have the capability to update, install, or remove plugins. That’s why site admins will not even see the plugins menu in their admin bar. However, if you network activate a plugin, then the site admins will be able to configure the plugin settings for their own site. To enable plugin’s menu for individual sites, you need to switch to Network Admin dashboard. On the network admin dashboard, visit Settings » Network Settings. Scroll down to the bottom of the page and you will see the checkbox to enable plugins menu. That’s all, save your settings and individual sites will now be able to see plugins menu. They will also be able to see installed plugins and activate them for their site. Note: Individual site admins cannot see network activated plugins.